It’s finally starting to feel like Fall and I’m finally starting to feel the Fall and I’m liking it! Of course this all fits into What I Ate Wednesday. That’s the fabulous food party started by Jenn at Peas & Crayons. Be sure to check it out after you’re finished here! Let’s see what’s been on the food agenda this past week? 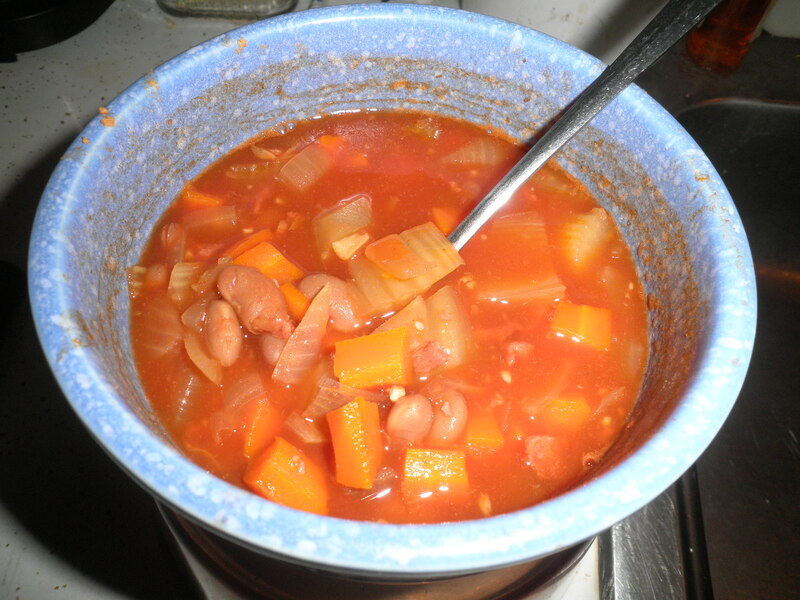 First…soup made from my leftover barbecue beans. Just cook up garlic, onions, carrots and celery. When they’ve softened add some water, but not too much and the leftover beans. It is so flavorful…warm and satisfying! 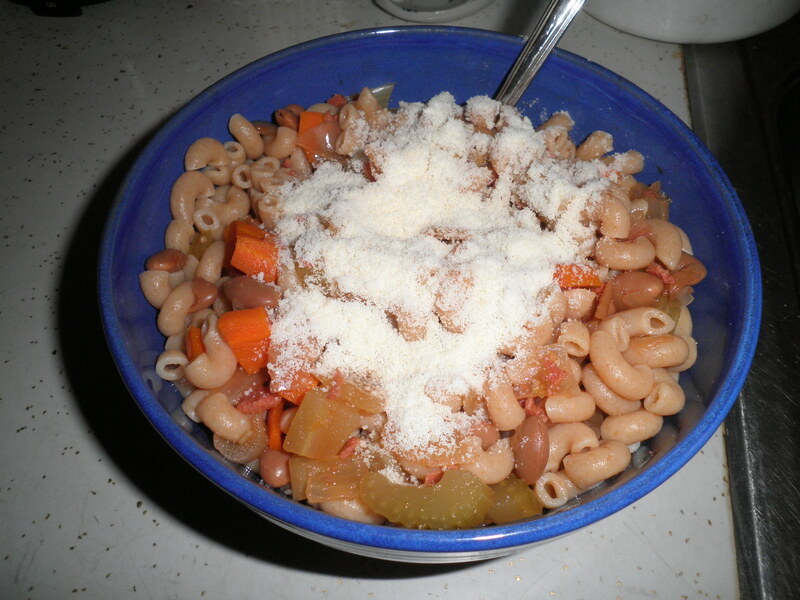 I wanted something heartier over the weekend, so I cooked up some pasta and used the barbecue bean soup as the sauce. Topped with some parmesan cheese…yummy! 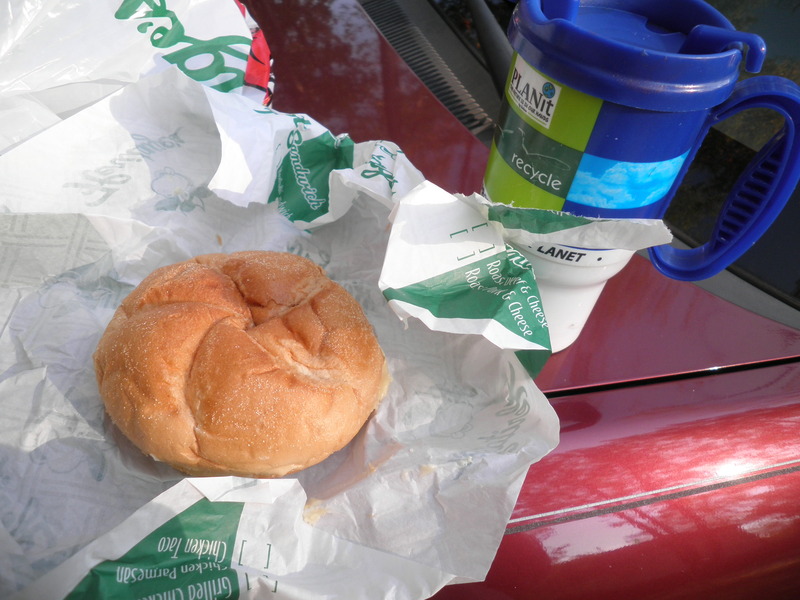 Breakfast eaten on the hood of the car! I brought breakfast to Ralph where he was camping out. This was my egg, cheese and sweet pepper sandwich. One of my favorites…Coffee on the side of course! 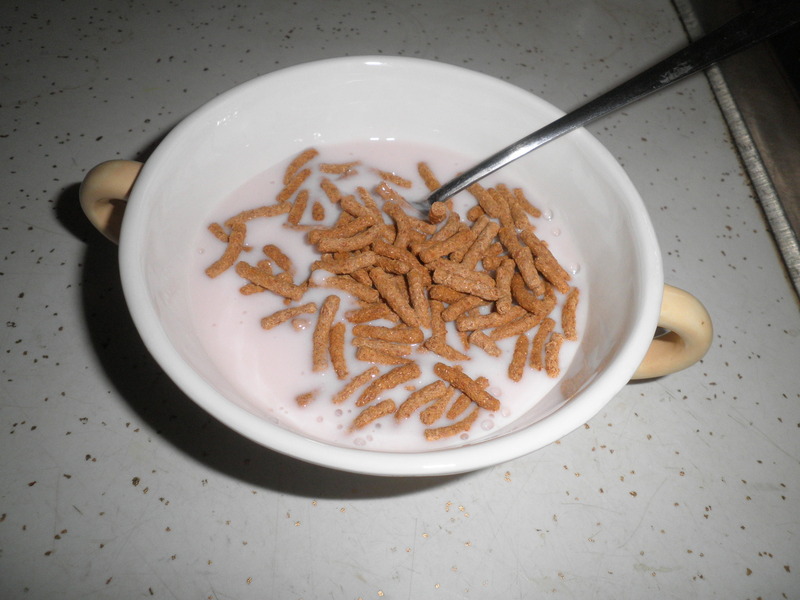 One of my favorite quick breakfasts…pomegranate kefir and Fiber One. 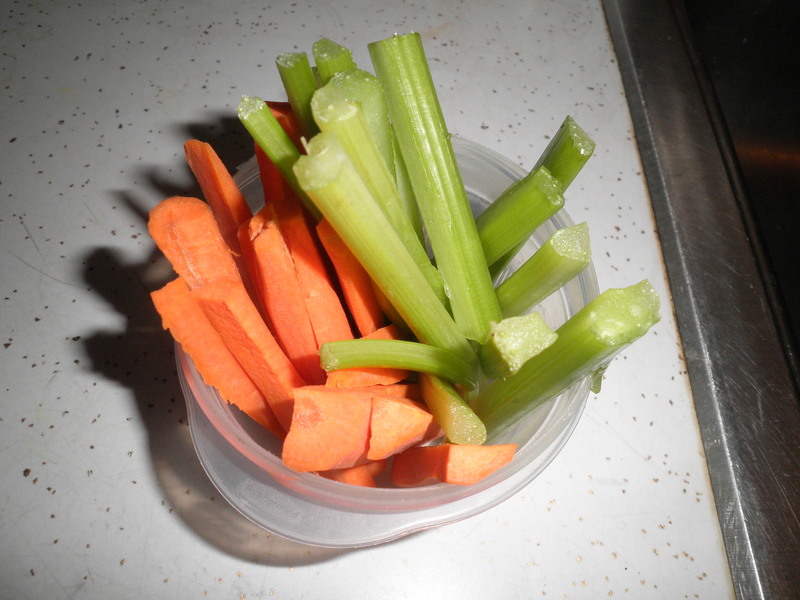 Doing my best to stay on track by having carrots and celery ready to use as those healthy snacks that are on our minds at WIAW this month! One of my favorite meals in quite some time. 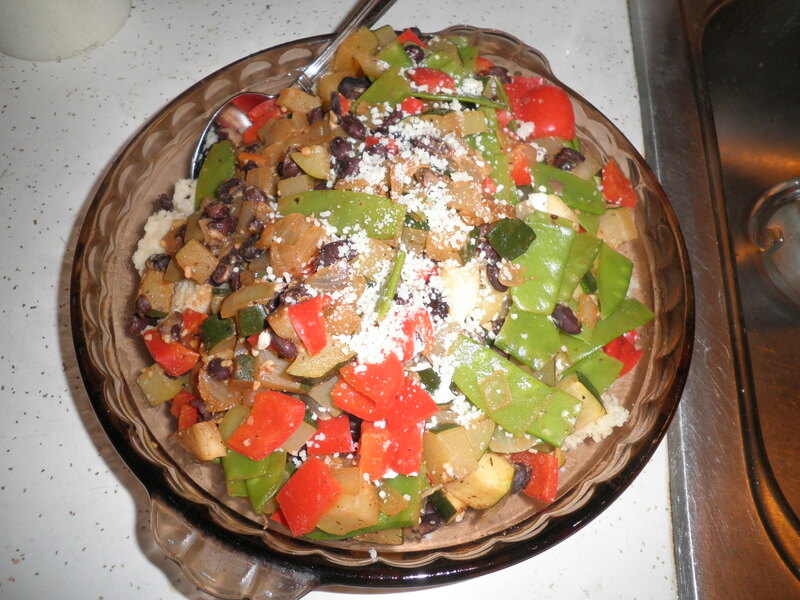 Cous cous topped with a sautéed mix of garlic, onions, zucchini, red pepper, snow peas, crock pot black beans and cottage cheese, topped with Locatelli cheese. This was so delicious and certainly filled me for the evening. I love finding things that fill me up. It’s so strange, but I almost need to eat more than I really want in order to be full and stay fill so that I don’t go looking for something to snack on. It doesn’t seem right that I have to do that, but it seems to work best that way. That’s why I make such huge salads…They Fill Me Up!! That’s What I Ate Wednesday for me today. I continue my quest to stay on track and stay full at the same time! Be sure to check out the fun over at Peas & Crayons, read some blogs, leave some comments. You’ll love it! Fall into the habit! Happy What I Ate Wednesday! Stay Full, My Friends!! This entry was posted in Uncategorized and tagged pasta, veggies, WIAW. Bookmark the permalink. Your cous cous dish looks good! It used to be my favourite grain but now that I’ve tried so many others I can’t say for sure anymore. What’s your favourite grain? Hi Suenne! I like cous cous and bulgur because all you do is boil the water and let them sit! Bulgur is also very inexpensive. For flavor I think I like quinoa best, especially because of the protein boost. I cook it with veggie broth and it’s just delicious. love the “photo on the hood of the car,” fran! nice that you could eat out-of-doors, almost like a picnic! beans can be so versatile – i throw them into my Big Salads, sometimes! happy wednesday – i am off to toronto! Beans are the best, Cathy that’s why I cook them by the crock pot full! Have a great time with the Girls!!! I love eating on the hoods of cars! It was something my family did when I was younger and we watched a lot less tv 😀 My parents would go pick up supper, maybe pizza, chinese, etc, and then we would sit outside and eat. Great memories! Alley, that sounds like a lot of fun! My husband was camping and I brought breakfast,it Was fun! My salads are always massive. My husband laughs at me because they’re so huge. That’s the great thing about healthy nutritious food, you can supersize without feeling guilty! Anna, you’re so right. My salads and veggie combos are ridiculously huge, but for me on the Weight Watchers program, they don’t count for much at all! You seem to be doing very well eating such healthy foods, great job! Everything looks delicious too! Glad you like the looks of my food. They ARE delicious! Thanks for visiting, please come by again! I love all the creative ways you use leftover/crockpot beans! Allie…basically…I’m cheap…I don’t like to waste food. My parents and grandparents lived through the depression…they taught me not to waste anything! I never would have thought to put leftover bbq beans into a soup – fabulous idea! I bet it made the broth even better! It was so tasty! I didn’t really need to add any seasonings…they were already there! The cous cous looks delicious! Thanks, Dana! It was one of my favorites of my recent concoctions! Thanks, Roz, it was yummy! Have a great day! Thanks, Jennifer! It was yummy! Yum!! I love that you used soup as a sauce for your pasta! Genius!! I never thought of it before Liz, but I was really hungry and this is what came out of my head! Hi Kimmie! I only ust discovered Kefir in about the last 6 months or so. It’s very tasty! Please stop by again!